This time, in addition to brewing some green tea and donning your favorite bathrobe, you might consider shining up the spurs and lacing up the chaps for this highly successful collaboration. 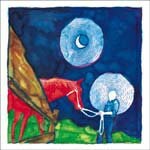 The number of Iron & Wine EPs now outnumber their full-lengths -- another testament to mastermind Sam Beam's fondness for the small form: in arrangement, song, and format. In an era where it's all too tempting to hit the shuffle button, when it's increasing difficult to find 40 solid minutes to devote to a record, Beam lays it out for you in perfectly graspable collections of intimate, sweetly melodic folk that can accommodate any schedule open to its subtle charms. In the Reins pairs Beam's songs with the accompaniment of desert rock swamis Calexico, expanding the range and repertoire of each. Particularly for Beam, when paired with his other 2005 release (the Woman King EP), In the Reins is a marked leap forward in production-proving that his songs, while gorgeous and perfectly functional as bare-bones four-track recordings, can support heavier instrumentation without losing their power and efficiency. It's important to note that these are not brand new songs, written purposefully with the collaboration in mind. Most appeared in live form, on early self-released tour EPs, and as part of the widely Internet-circulated "9/20/02" batch of songs that still holds a few unreleased treasures. For the fan that has already had his/her greedy little mitts on these recordings, In the Reins might at first seem like gratuitous frosting-but with time, the added textures and altered tempos begin to feel just as natural as their more humble beginnings. Occasionally, the Calexico collaborations are hands-down vast improvements. "Burn That Broken Bed" does laps around its torpid earlier incarnation, "Overhead", with its smoky saxophones and jerky rhythms adding much needed interest to one of Beam's most repetitive grooves. "History of Lovers" is also played twice as fast as the four-track version, radically altering the mood of the song from hushed and cuddly to confident and propulsive. Not only do the pedal steel, horns, and traditional drum kit sound lush and vibrant, they also sound warranted-as if embedded in the song's DNA to bloom at this specified moment after a prolonged, mellow adolescence. Beam also sounds ready and at home with Calexico behind him, gunning the pedals on his trusted Model T. His beloved whispered croon is intact throughout, as comfortable in the sprawl of Convertino & Burns' soundscapes as in the wool-sweatered world of home recording. There's, thankfully, no need to raise one's voice here to top the din, as the production measures every ingredient out with care, allowing each participant to do what they do best without strain or restrain. The sole drastic decision, the one most likely to twist necks and start coffeehouse brawls is the addition of mariachi singer Salvador Duran on "He Lays In Reins", which kicks off the album. More than the flamenco-strummed guitar, fluid drumwork, or staccato piano notes, Duran's dramatic solo is a big surprise, and an even bigger risk-one that may or may not pay off for some listeners. But the song, in some ways, already lived in the world of Calexico and All the Pretty Horses with lines like "One more kiss tonight / From some tall stable girl / She's like grace from the earth." In fact, each of the songs here already contained the seeds of what they would become on In the Reins, from the funk/blues of "Red Dust" to the gentle closer "Dead Man's Will". The latter is yet another example of Beam's penchant for writing in anticipation of the grave or from beyond it. Mildly embellished with marimba and ambient noise, the song addresses a messenger to deliver sentimental items to his family members and lover ("Give this stone to my brother/ 'Cause we found it playing in the barnyard many years ago/ Give this bone to my father/ He'll remember hunting in the hills when I was 10 years old"). I won't spoil the best lines for their clever efficiency or emotional impact except to point out that when you're working with material that is as fundamentally solid, it's hard to go wrong.